For many entrepreneurs, the motivation to log long hours, take incredible risks and work for peanuts is, simply, the exit sign--the prospect of selling out and cashing in. One of the most common questions I was asked while building my company was, "What is your selling price?" It didn't matter what stage the company was at, what it was worth or what its potential was. I thought there'd be a day when I'd get an unsolicited envelope in the mail, freeing me from the stress and financial pressures of running a company. On top of that, I'd get to name the price. What a deal. Nothing could be further from reality. Exits happen because acquirers open windows of opportunity. Like a real house, windows open from the inside. 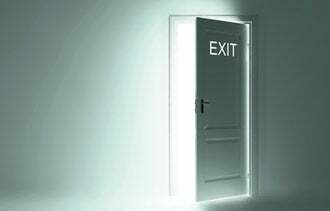 The notion that founders can force an exit is a bit like thinking they could walk up to a house, open a window and sit down with the owners without recourse. In most cases, exit windows come about because of the circumstances of the acquirer, not just the seller. Display your wares. Make sure your activities are visible. Potential acquirers need to know what you are up to. Maintain a presence at trade shows. Get mentioned in industry publications. Make your company successes known. It's not always about your company. The dynamics that place an acquirer in a position to buy a company are just as complex as those that position a company for a sale. Acquisitions require access to cash, strategy discussions from top management, internal champions to push the issue and, ultimately, a team that will absorb the incoming company. Those things don't always line up, so assuming a company will buy you just because it is big and powerful is like assuming grizzly bears are always hungry (they hibernate, too). As you get bigger, your options shrink. It is somewhat counterintuitive, but as company valuations increase, exit options decrease. Not only do companies get too expensive to buy, but if they've made an amazing run, it's likely because they've navigated a new frontier that doesn't have a lot of competitors (i.e., potential acquirers) to begin with. Companies like Facebook, for instance, have evolved from dozens of acquisition offers early on to just a few suitors in recent years. Now, realistically, an IPO is the only cash-out option. This is certainly not a bad thing, but founders need to realize the farther they go down the path, the fewer people they will see on it, and adjust their exit expectations accordingly. Once founders realize storybook endings are rare, they can focus on strategies to make real exits occur. By making sure potential suitors are tracking your progress, understanding their internal dynamics and ability to acquire and continually benchmarking your expectations with growth, you will be ready when the window opens.